Rear end collisions have been the bane of insurance companies for years with the whiplash culture that appeared in the noughties. I hope this system is brought into cars in the very near future as this will reduce accidents and ultimately premiums. Driver aids are more commonplace in the industry and this one should be welcome. Unlike the cbs on bikes this could be useful. Rear-end collisions account for a significant proportion of road accidents. In order to address this problem, Volvo Trucks has developed Collision Warning with Emergency Brake— an advanced emergency braking system which also includes early collision warning. The braking system, which is available on the new Volvo FH Series, has been developed to support the driver so that the majority of these rear-end collisions can be avoided or mitigated. We began by asking ‘what really is the problem?’. The answer is inattention. If you watched the traffic ahead of you the whole time, you wouldn’t need systems like these. The new system combines a radar and a camera that work together to identify and monitor vehicles in front. The system is designed to deal with both stationary and moving vehicles and can prevent a collision with a moving target at relative speeds of up to 70 km/h (43 mph). When the system detects a vehicle that the truck will hit at its current speed, the warning system activates a constant red light in the windscreen in order to bring the driver’s attention back to the road. However, if the truck fails to detect any reaction from the driver, such as steering or braking, the system upgrades to a flashing red light and a beeping sound. If there is still no reaction, the system applies the brakes gently. When all this fails, the system activates the emergency braking system and does everything possible to bring the truck to a complete stop. We don’t want to take over from drivers because we believe they are in the best position to respond, as they might be able to safely drive around the vehicle. In the vast majority of cases, the initial warning signals will attract the driver’s attention. And in the rare case that they don’t, the emergency braking system will still help prevent a serious accident. In Europe, emergency braking systems will be a legal requirement in new trucks by November 2015. With another photocard set to replace the current format of card and counterpart the dvsa has decided to have an intermediate change to help with the fight against fraud. 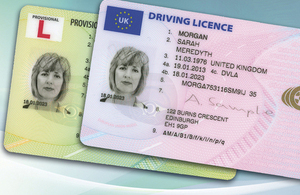 DVLA has introduced a new style photocard driving licence from February 2014. Holders of valid driving licences will not need to replace their current driving licence. The old driving licence format is still valid and will be updated gradually as they are renewed and replaced. The new card, provided by Gemalto (UK), will have a refreshed design and incorporate a host of improved security features including a new security holograph, raised surface pattern and an Optical Variable Ink (OVI) which will continue to keep the driving licence secure. The latest security features will also help in the fight against fraud. If you are an organisation which regularly checks photocard driving licences you’ll need to be aware of the changes to the cards design. If you have any concerns on the validity of a driver’s licence you can check the employing people to drive section. Smoking ban continues onto passengers next. Many drivers are unaware that smoking while driving has In fact been illegal for a number of years now. It carries the same on the spot £100 fine as eating or drinking (non alcoholic) when behind the wheel. now the government wish to ban smoking by anyone in a vehicle when there are children in it. MPs have backed calls for a ban on smoking in cars in England and Wales when children are passengers. They voted in favour of a Labour-supported amendment to the Children and Families Bill by a majority of 269. This will give Health Secretary Jeremy Hunt the power to bring in a ban in England, while Welsh Government ministers will decided in Wales. Last week, more than 700 experts wrote to MPs urging them to back change. But critics say legislation is not needed. The amendment – passed by 376 votes to 107 – empowers, but does not compel, ministers to make it a criminal offence for drivers to fail to prevent smoking in their privately owned vehicles when children are present. Much of the debate about banning smoking in cars has been talked about in terms of protecting children. That is understandable. Research published in 2009 showed that a single cigarette in a stationary car could produce levels of second-hand smoke 11 times greater than that found in a smoky bar. Although it should be pointed out that the study also said if the car was moving and a window open it reduced the toxins to well below that level. But it is also an inescapable fact that this issue is the latest in the fight to make smoking socially unacceptable. Introduction of car and trailer testing on motorcycle manoeuvring areas. You may have noticed recently that we have marked out an additional rectangular area on some motorcycle manoeuvring areas. This is so we can carry out car and trailer testing (B+E) at these sites. We have taken steps to ensure that the manoeuvring areas are safe for use by multiple testing categories. This includes designing the reversing area so it doesn’t interfere with any of the high speed manoeuvres. Although non slip paint has been used and slow manoeuvring is safe when crossing the painted areas, we advise that the wide yellow stopping box area is not used for any manoeuvres. Before any motorcycle testing activity takes place the area is checked by the motorcycle examiner for damage and spillages. It’s important you do the same if you are using the area for training. These tests will offer better utilisation of our motorcycle manoeuvring areas and should not affect the number of motorcycle test bookings at these centres. I received an email today about a company specialising in young driver insurance using telemetrics (black box). The idea is simple, through gps your driving habits are tracked and good habits are rewarded. “Nothing ing new there then “I hear you say. Well yes there is, this particular company will also sell you a combined deal, a car and the insitance to go with it. These deals start at just £155 a month. What’a stopping you?